Pantone, as it is today, was founded in 1962, when the company—at the time a small business which manufactured colour cards for cosmetics companies—was bought by Lawrence Herbert, who had been an employee since 1956. He immediately changed its direction, developing the first colour matching system in 1963. Herbert remains the CEO, Chairman, and President of the company. The company’s primary products include the Pantone Guides, which consist of a large number of small (approximately 6×2 inches or 15×5 cm) thin cardboard sheets, printed on one side with a series of related colour swatches and then bound into a small flipbook. For instance, a particular “page” might contain a number of yellows varying in luminance from light to dark. The idea behind the PMS is to allow designers to ‘colour match’ specific colours when a design enters production stage—regardless of the equipment used to produce the colour. This system has been widely adopted by Graphic Designers, Reproduction and Printing Houses for a number of years now. Pantone recommends that PMS Colour Guides be purchased annually as their inks become more yellow over time. Colour variance also occurs within editions based on the paper stock used (coated, matte or uncoated), while inter-edition colour variance occurs when there are changes to the specific paper stock used. 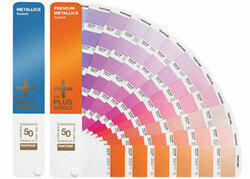 The Pantone Color Matching System expands upon existing color reproduction systems such as the CMYK process. The CMYK process is a standardized method of printing colour by using four inks—cyan, magenta, yellow and black. The majority of the world’s printed material is produced using the CMYK process. The Pantone system is based on a specific mix of pigments to create new colours—referred to as Spot Colours. The Pantone system also allows for many ‘special’ colours to be produced such as metallics and fluorescents. While most of the Pantone system colours are beyond the printed CMYK gamut, those that are possible to simulate through the CMYK process are labeled as such within the company’s guides. Pantone colours are described by their allocated number (typically referred to as ‘PMS 130’). PMS colors are almost always used in branding and have even found their way into government legislation (to describe the colours of flags). In January 2003, the Scottish Parliament debated a petition (reference PE512) to define the blue in the Scottish Flag (saltire) as ‘Pantone 300’. Countries such as Canada and South Korea and organizations such as the FIA have also chosen specific Pantone colours to use when producing flags. It is open to speculation whether legislators realize that Pantone may choose to reformulate the colour.